The Lamborghini Huracán Performante is the high-performance trim level of the already high-performing regular Huracán. The Lamborghini Huracán Performante has about 30 more horsepower than the lesser Huracán. We drove a $320,785 Huracán Performante and were extremely impressed — although we couldn’t take this supercar to the track, its natural home. A funny thing has been going on with Lamborghini. When I was growing up, the Italian legend’s supercars were considered wilder and crazier, cruder and more tasteless, than Ferraris. If you liked Lambos, you kind of knew what you wanted to be when you grew up, and it wasn’t necessarily civilized. Since the late 1990s, however, Lamborghini has been owned by the VW Group and allied with Audi. This structure has tempered some of the old Lambo stuff, beneficially making the brand more dignified, easy to live with, and more technologically up-to-date. That sounds great, but what about, you know, the Lambo-ness? Well, we’ve seen the benefits played out in the Huracán lineup. 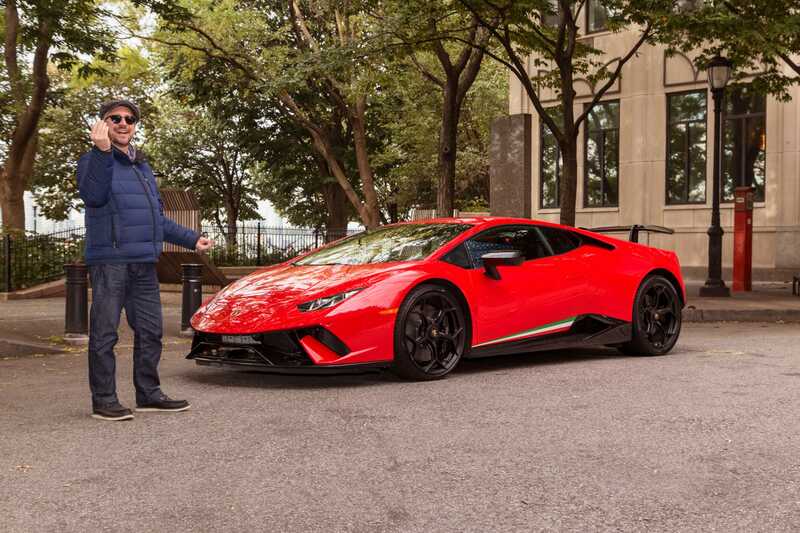 Lamborghini sells three cars: the Huracán sports car-supercar, the Aventador super-hypercar, and the new Urus SUV. The Huracán is meant to provide a little something for everybody who wants to get into the brand. Hence an all-wheel-drive version that can be mistaken for an Audi, a rear-wheel-drive version that can’t — and that remind Lambo lovers of the Lambos of the 1970s and 1980s — and a drop-top Spyder for open-air motoring, and now a track-oriented car, the Performante. Yes, it looks like a race car. But it can be taken on the road. And then to the track. And back to the road. It’s for that type of well-heeled enthusiast who wants to test their driving skills, as well as tool around and stun the neighbors. Lamborghini let us borrow a 2018 Huracán Performante for a few days. Here’s what we thought. Behold! The shark-like Lamborghini Huracán Performante, in a dashing „Rosso Mars“ paint job. Our tester was the all-wheel-drive version. The Lamborghini Huracán Performante is the „regular“ Huracán turned up a few notches. The ferocious architecture of the Huracán remains: this is a classic mid-engine supercar. Unlike Lambos of old, the Huracán has gone for a more stately, dignified vibe. In as much as that’s possible for the snarling bull.